Handheld pies are a special treat. Not only do you get to eat pie, but you can do it on the go! Plus, if it is already proportioned into individual pies, then you wont have the fear of eating the whole pie! Not saying you are going to eat the whole pie, but it could happen. I has happened. I prefer to not talk about it. Last weekend at the B&B, we did a special wedding for a couple that had their friends come join them and they booked the whole B&B! So, naturally, I made a bunch of pies for them. Although, I think they were mostly eaten by Morelocks. What can I say? We like pie. And there’s a bunch of Morelocks! These pies are easy, fun and super tasty. I would say that you should definitely go with in season fruit, or frozen fruit, to ensure the level of sweetness is reached. I used blackberries and blueberries, both of which are going out of season. They were definitely not sweet enough. I also used a peach/nectarine mixture in one and it was off the chain! (That’s right.. I said off the chain. They were really good.) I would have definitely eaten an entire pie of the peach/nectarine mixture. Good thing they were mini’s! I got my pie recipes from a cookbook Debbie bought me awhile back. It is called Handheld Pies by Sarah Billingsley & Rachel Wharton. If you see it laying around at a bookstore, get it. It is full of so many useful tips for making crusts and how to fill them. All kinds of cool stuff. Stuff I didn’t know. One thing I will express (aside from using in-season fruit) is to constantly keep your dough cold. While you are rolling your dough out, put extra in the fridge. As you are filling your crusts with delicious fruit, keep spares and ones you have finished in the fridge. After you fill them, make sure you put your pies into the fridge (or freezer) for at least 30 minutes.. the longer the better, overnight even! The butter (or lard or cream cheese) needs to be in small pieces throughout the crust in order for the crust to puff up all pretty. If you let the dough sit out for too long (at any point in the pie making process) then the butter will start to soften and eventually melt and meld with all the other ingredients. You don’t want this to happen until you are actually baking it. I think this is why it takes so long to make pies… the chilling. So, here is the lard crust recipe (the authors stated that they prefer the lard crust over any other for taste, flavor and consistency). They have 4 different crust recipes in the book, all work better for different types of handheld pies. 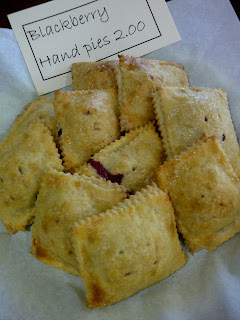 I used the lard recipe for my small mini pies and the cream cheese recipe for the little handheld square (pop tart-like) pies. 1. Cut or break the lard into 1-in chunks, and freeze them while you measure and mix dry ingredients. 2. In a large bowl, whisk together the flour, sugar, baking powder, and salt. Retrieve the lard chunks from the freezer and distribute them evenly in the flour mixture. Sink your fingers into the mixture and begin pinching the lard and flour together, making thin, floury disks of the lard. Continue working the mixture until the lard is broken down first into floury pea-sized beads and then into a loose mixture that resembles wet sand. Drizzle in the cream and use your hand like a comb to mix in the liquid just until the dough holds together. 3. Turn the dough out onto a clean, floured work surface or a sheet of parchment paper. Gather the dough together in a mound, then knead it a few times to smooth it out. Divide it in half, and gently pat and press each half into a rough circle. Wrap in plastic wrap or parchment paper and refrigerate for at least 30 minutes or up to 3 days (or freeze for up to 3 months). OK, for pie assembly. They wrote a lot about it and quite frankly I don’t feel like copying all of it. So, I’m going to give it to you plain and simple. Go buy the book if you want a more in-depth explanation. Next, using a large circle cookie cutter (or anything you have laying around.. a floured cup rim works) cut out the dough into circle that are about an inch or so wider than a muffin tin cup. (Forgot to say this… line a muffin pan with cupcake liners or just butter it good and put the dough straight into tins.) So, you just put a circle of dough into each muffin tin. Put it back into the fridge for awhile. Pull it out and fill each one about 2/3 full of your peach filling. Put it back into the fridge. Chill for how every long you can stand it. Pre-heat the oven to 375* about 10 minutes before you take the pies out of the fridge. If you use some dough to top the pies (I did not, but it would be tasty! ), then whisk one egg and brush it over the tops of covered pies and sprinkle with some decorating sugar or sugar in the raw. Bake for about 15-20 minutes or until golden brown. Let them rest for a little bit to cool. Top with, of course, ice cream! Enjoy! This entry was posted in From the kitchen, Intimate Texas Weddings, Recipes by admin. Bookmark the permalink. Great recipes. I love the idea of the pint sized “serving” of pies; as I sometimes have the same problem with the problematic open serve pies. I also had that problem once…but in my defense, it was Thanksgiving.